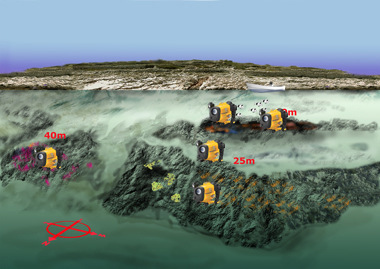 We know about 60 different dive sites of which we regularly visit about 30. 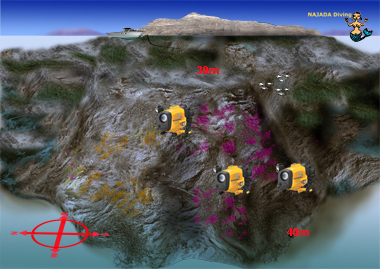 To find out more about a particular dive site, click on it on the map. In addition, you can use the table below to scroll through them. It also includes a search function..
Small and Big Babuljasi are located in the NE of Zut. 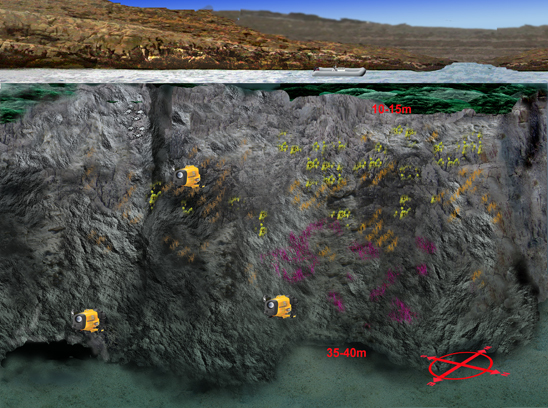 In the S of Babuljasi a wall starts, first very shallow (10m -15m) falling down to 45m. Babuljasi is famous for its Red Gorgonian colonies which grow, contrary to other places, not on the wall but mostly on the ground. If you continue the Gorgonian come up to 22 m and we have seen some bright Yellow Savalias on about 26m. Mali Babuljasi is a gently dropping slope. If the weather allows, you anchor on the north cape of the island. For advanced divers we recommend swimming direction N and to make a blue descent to 20-25m, directly to the red Gorgonian. 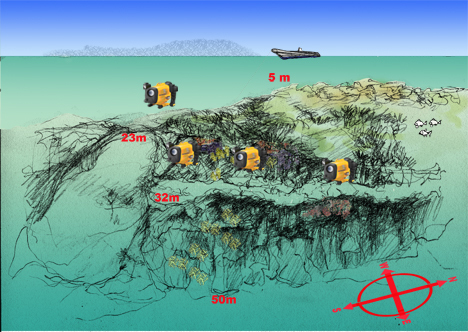 The less experienced can follow the slope from the anchor place, over the Posedonia W-NW, where the first Gorgonian start on 20m. Balun is one of the more northern Kornati islands. 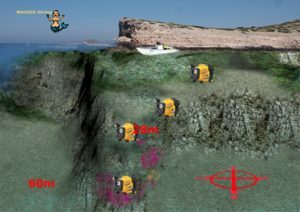 Swim to the SE till you approach the wall in 20m depth. Follow the wall with your right shoulder until you hit a ridge that goes southward. The eastern part in 26m after a small terrace is covered with red fan corals and sponges in a unique density. The growth and multifold of the Gorgonians are really impressive here. An alternative route is to follow the wall westward and then the ridge to the south till the small terrace. Pass by the island of Samograd, in the prolongation of Kurba Vela (the big prostitute) you will find a small rock hardly above the water level. A wall, from NW to SE offers you an underwater landscape with two Gorgonian walls. In NW you will find parts of Borko already in 10m. 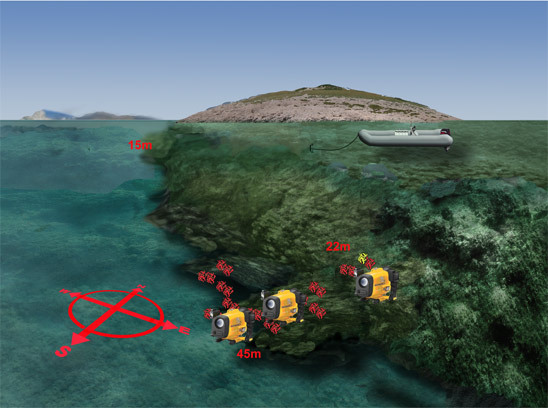 Follow this direction; after seagrass and sand at a depth of 44 m you see the wreck of Borko. Looking to the South you cannot miss the view to the light house of Blitvenica. The tower points to the South and there is a huge wall. 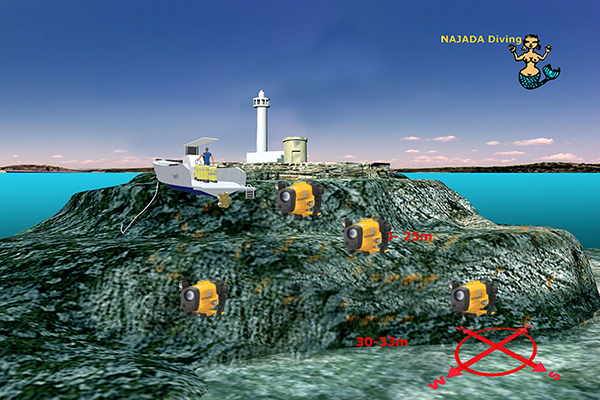 In the middle you find a big concrete block which parts the wall in two dive excursions. Both parts are overgrown with red and yellow Gorgonians. 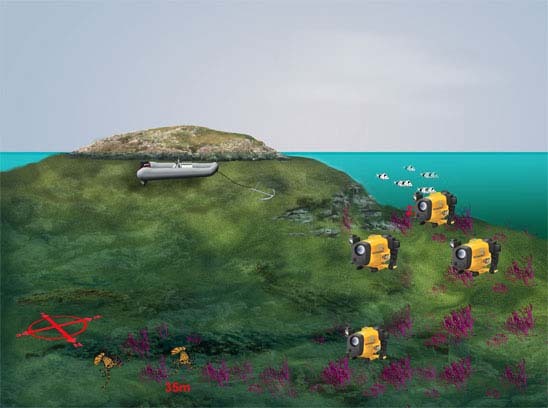 In the SE part you will find a big school of swallowtail seaperches (there is another big school in the Dome). For tec divers a 2nd Gorgonia hill start from 50m. Approach the GPS Position from West! 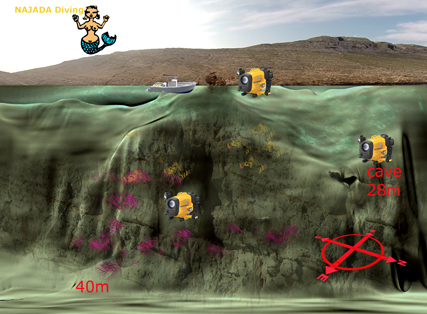 Anchor as soon as the depth meter shows 14 m. Swim towards WNW, the wall goes in the connection of Cavlin towards Murter. You swim down a hill, turn right shoulder and you find yellow Gorgonian. Go further down, there are red Gorgonian which go a long way down to the depth along the wall. We followed the drop-off down to 50m and the wall still continued. Perfect extended range dive! Pass by the bay of Piskera on the outside of V. Panitula until you see a small, triangular shaped anchor ground. Dive down on the outside edge, red gorgonian at 30 meters. Second dive should be the Dome, the ceiling is covered with bright sponges and soft corals. 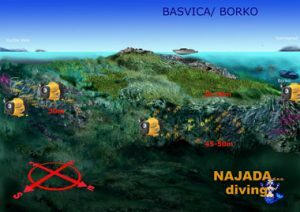 Probably the best dive place in Kornati. Though still many people exist in Murter who witnessed the shipwreck of Francesca, not too much information could be gathered up to now. According to the reports a scout plane found Francesca in front of Kaprije island, with an engine break down, fully loaded with ammunition for the troops in Africa. After the attack of fighter bombers a part of the ammunition exploded and Francesca sank. 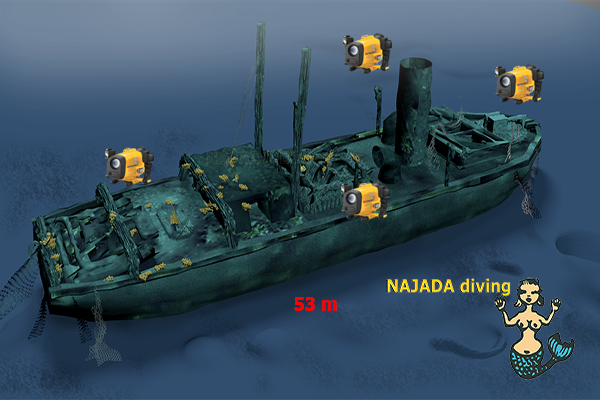 There are some other versions: According to other sources the wreck of Francesca rests in Pula and some witnesses claim that the ship resting in front of Kaprije is not the Francesca at all. However, she is one of the most beautiful wrecks in Adria, covered with sponges and soft corals surrounded by schools of fish. 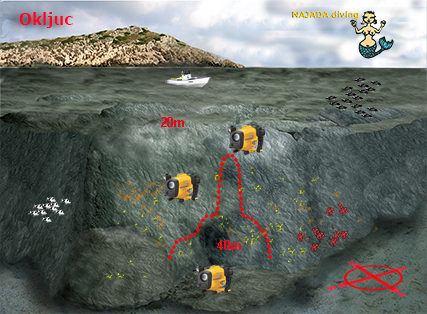 Because of the depth, only for experienced divers. The „Gladiator“ rests on 53 m, the deck on about 45m. This is definitely an adventure for experienced divers! The „Gladiator“ was built as a towing ship 1915. She sank 1941, off the coats of Zlarin, after being hit by a mine. The ship is about 30m long, is nicely overgrown and has many interesting constructions. A narrow corridor and several openings allow a view to the inner parts. 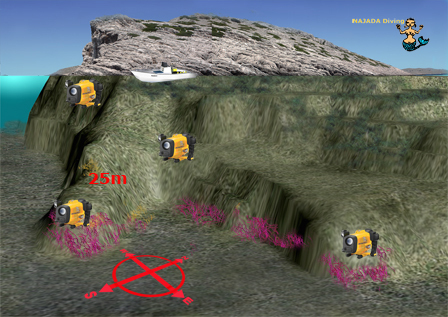 The dive starts in the south of a small rock next to Kablinac. After some fin-strokes above sea grass you reach a sandy plateau . 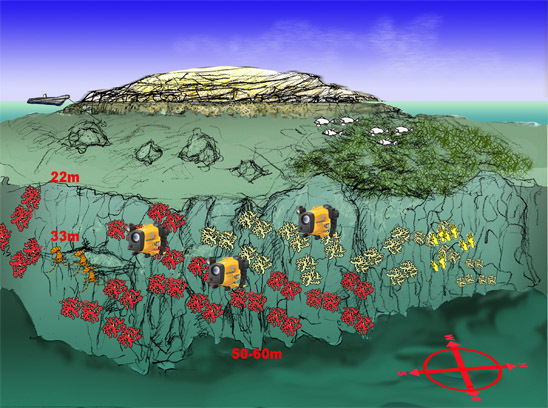 The wall starts next to it in approximately 20-25 m. The wall goes around the island from SW to SE. Right shoulder you find Yellow Gorgonian, left shoulder (SE) you have a beautiful overhang and the wall is overgrown with Red Gorgonian. In SW a more shallow wall is partially covered with a huge fishing net. Kamenar, the “Stone-Hill” is located E of the island Zut. An underwater rock comes up close to the surface. The upper plateau is structured in soft hills, an ideal anchor ground and a nice area for your safety stop. Though it is outside Kornati National Park it shows the same type of landscape. 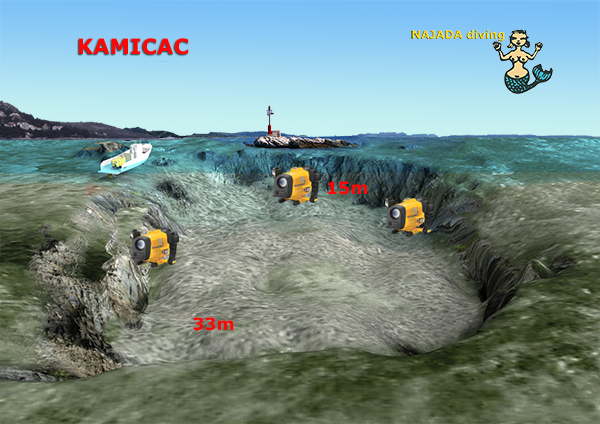 The lightfire of Kamicac is opposite Slanica.You anchor in the shallow part in the NE of the island as close as possible to the drop-off. The wall is nicely structured, octopus, nudibranchs and lobsters hide in the cracks. Approaching Kaprije island the same way as to Francesca you see in direction west a small cape which marks the anchor area. Under a small platform you find in moderate depth (15m) soft corals and colourful sponges, ideal for beginners and for a second dive. In 25-30 meters a second overhang starts. The drop-off is covered with Yellow Gorgonian. Very nice landscape under water. Dive over the drop-off (left shoulder) to nice hills overgrown with Carophyllia. In appr. 20m a ridge branches off. Follow the hill till you find in 35m Changing Color Gorgonian. After the hill, follow the wall to another hill with nice growth of Gorgonian. Some 100m northward from the entrance to Kornati National Park you will fnd a small bay. In 10-15m a narrow plateau stretches along the wall. The vegetation starts immediatly beyond the drop-off. The bottom is shallower than the usual “deep blue” of the Kornati walls. 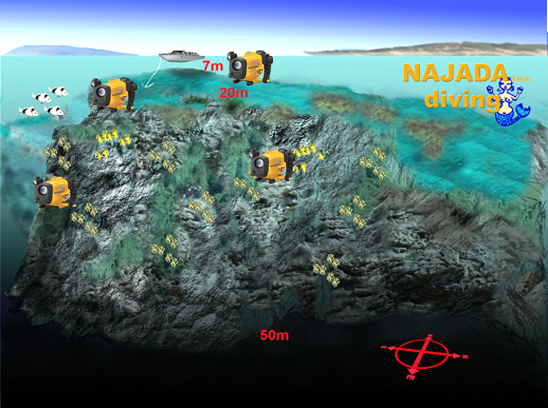 All together the ideal spot to familiarise also unexperienced divers with the excitement of wall diving. 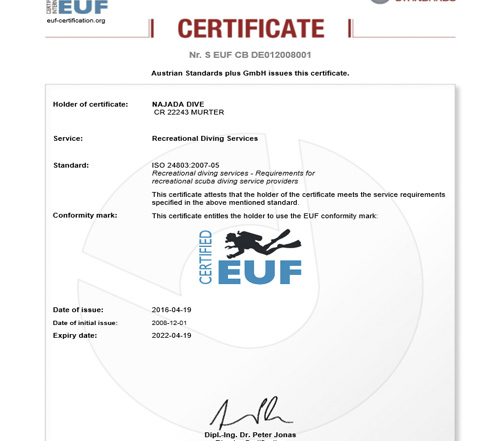 We perform the dive usually as a drift dive. You pass a nice crack, after the crack there is a cave in 40m !!! Only for experienced. The Kukuljari is a group of islands located in the SW of Murter island; the dive sites are on the island closest to Murter with the light-house. The W-side is sheltered and offers a perfect anchor ground. 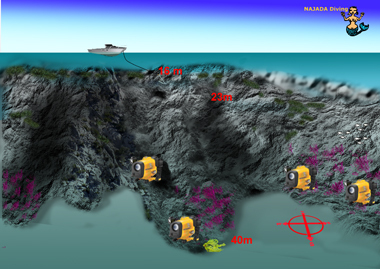 On the NW-cape is a small cavern with colorful sponges (22m). 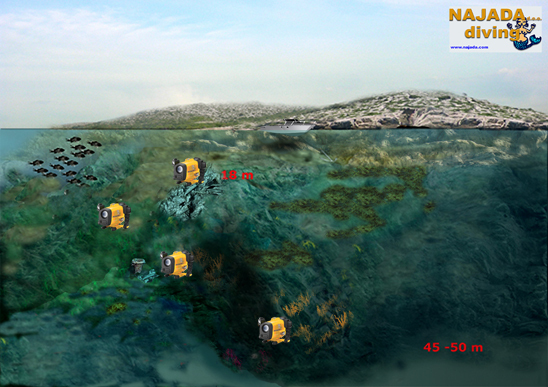 On the E-side you will find everywhere rich marine life, walls with yellow corals and schools of fish. Approach from the W till you see the drop-off on the sonar. In the N of the wall you find parts of antique tubes and amphora, which according to the tale, where transported on the sunken cargo ship. The wall is covered with beautiful yellow soft corals. 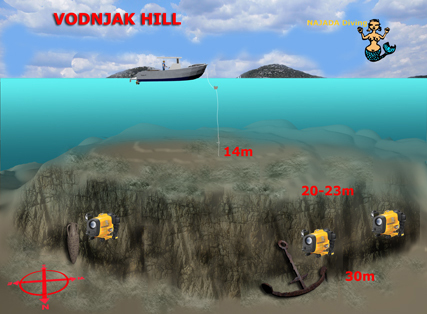 Top of the hill comes up to approximately 3m; swim in direction NW to the drop-off, then right shoulder to the N; great wall; big anchor in a valley, with a small cave underneath, approximately 35m. Another anchor is on 18m, direction NW. Rocks with interesting shapes in the shallow part. On the top of a rock you see the remains of an old stone village, on the bottom a ridge continues under water to SW. Go down along the ridge and swim back left shoulder. The upper part is covered with yellow sulfur sponges, nice cracks and little caverns, that make the site attactive for beginners. Down the wall the growth changes to yellow and red gorgonian. 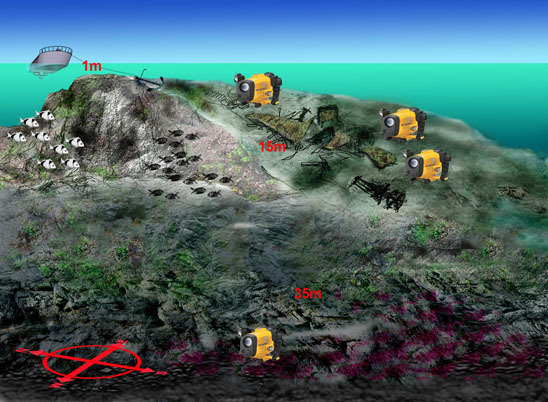 South of Zut an underwater hill comes very close to the surface (take care with your boat). In SE a small wall drops down. If you swim 90 degrees from the wall you hit a Gorgonian colony pointing to Babuljasi. 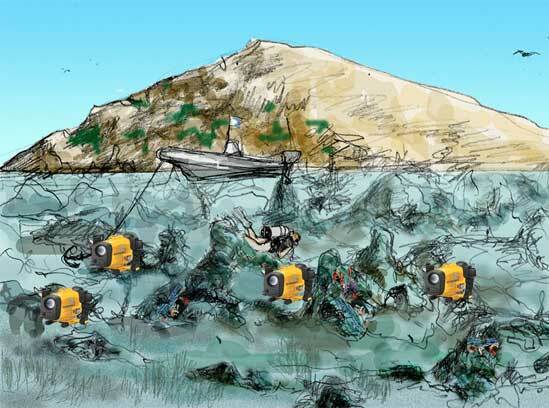 Swim back around the wall and you will find parts of an unidentified wreck. Though the parts themselves don’t look like too much, rich marine life is hidden beneath the plates and bars. Misi shows strong current on a regular basis usually from the N; with a proper briefing, also beginners can hide behind the rocks to be protected. Anchor next to the island and swim to the W. After a plateau you find the drop-off. A bump comes out of an UW hill which is overgrown on one side with Yellow and on the other with Red Gorgonian. Anchor in 15 m. From the GPS point go to WWS to the drop-off and continue left shoulder to the Gorgonians in 40 m. Between some Gorgonians and the hill with intensive growth there is an entrance to a chimney. It starts in 40m and goes up to 20m. At the end there is a window where you can look out, but unfortunately too small to swim through. We have seen several times groupers. The wall goes NNW to SSE. An above-water half-cave marks the site. Dive down the valley in direction NE. In appr. 28m you find a cave. Only experienced divers should go in. Continue the dive with your right shoulder along the wall, nicely overgrown with yellow and red Gorgonian. From the GPS point 32 finstrokes towards the E. Wall similar to Kukuljari, a lot of Yellow Gorgonian and Sulphur Sponges. 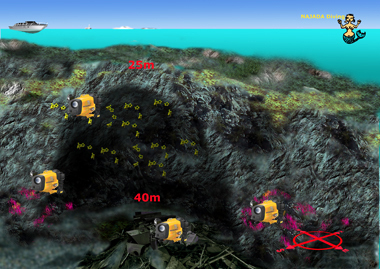 Underwater hill, comes up to 5m. Go towards E from the GPS point, the drop-off is in 24m. Dive down the slightly overhanging wall. 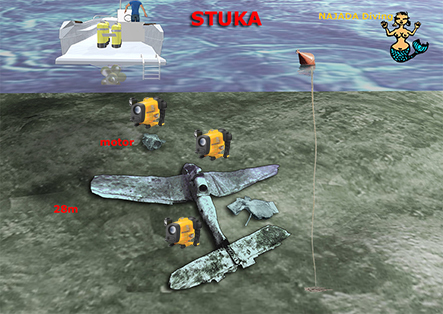 On 42m you see the remainings of an approximately 35m long ship. All wooden parts are rotten, but many metal parts are lying around. Left and right of the wreck are impressive Gorgonian hills. The wall itself is full with sulphur sponges. Underwater plateau in the South. 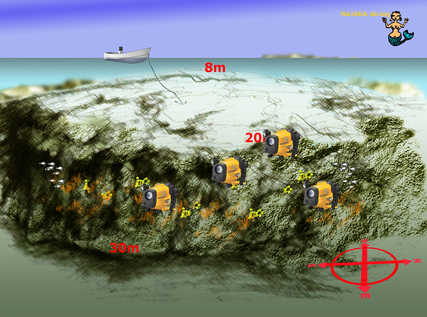 Anchor in 16m; swim toward S, left shoulder along a peninsula with an overhang. Turn around on the bottom of the peninsula with a big False Black Coral. Cross the bay to another wall where we have seen in one dive 6 greater Fork Feards (“Conger’s Mother”). Perfect Advanced Nitrox dive. North from Smokvica you enter usually the Kornati National Park. 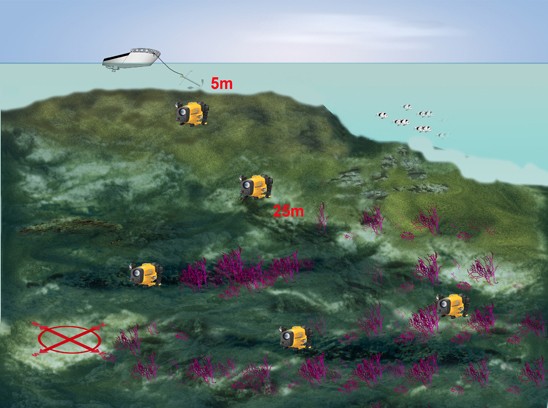 On the E-side about 0,5 miles from the shore is an underwater hill, that comes up to 2m. Anchor as close as possible to the drop-off which is in SE-direction from the top. 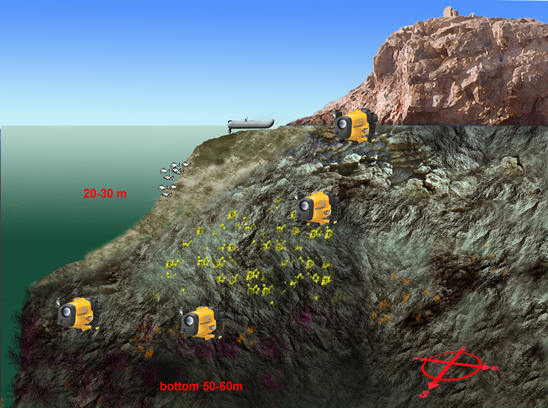 After some meters swimming above sea grass you find the first wall (23m). A second wall is in 30 to 35m. Look for congers and murrays. The Junkers Ju 87 or Stuka (from Sturzkampfflugzeug, „dive bomber“) was a two-man (pilot and rear gunner) German dive bomber and ground-attack aircraft. It was shot down on the 1.April 1941 by anti-aircraft defence of the Kingdom of Jugoslavia while attacking Šibenik. It was found after 73 years by spear fishers September 2014. The pilot was forced to land on sea and obviously the crew survived, since the cabin was found open.The whole plain was found in good condition, except the engine, that was for some time in a bay nearby. The machinegun and instrument console were taken out for restauration and conservation and will be in the future in a museum on the island of Žirije. The motor is meanwhile transported back and lies next to the plane. Go to top of the hill, swim in direction between the two Babuljasis. The top of the hill is easy to dive, but not exciting. The Gorgonian start at app. 35m and are only for experienced divers. Sometimes reasonable current. Leaving Murter in the westward direction, Visovac is the first island. Look for a white cubic stone on the east side, anchor in front of this stone. 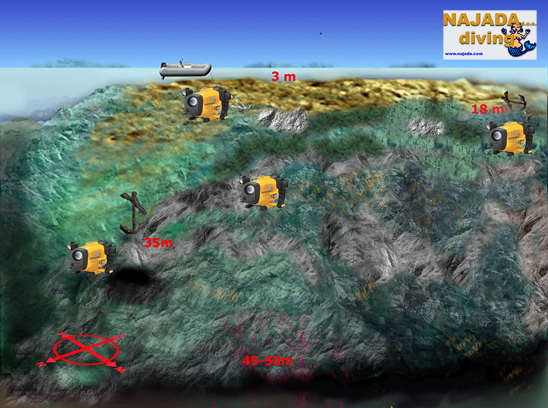 The dive site covers an area of approximately 100x100m and is nicely structured. A lot of interesting animals have been seen here, like Conger eels, Sepias, St. Peter’s fish and more. Perfect night dive. On the GPS spot a bouy with a rope guides us to the top of a plateau (14m). 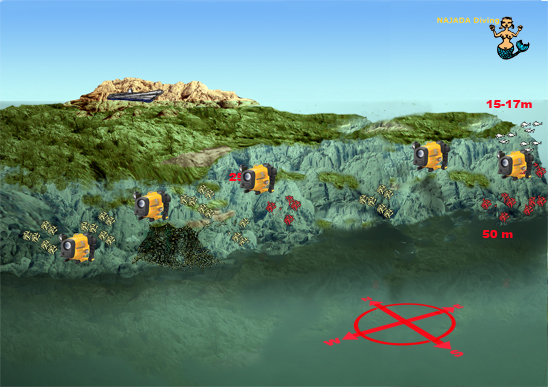 Swim about 30 kick-cycles towards NW until you reach the drop-off in appr. 20m and continue right shoulder. After some fin-strokes you will find the largest anchor of this region (appr. 4,5m).